When importing a 3D object created in a 3D modeling application, such as Maya, Cinema4D, Blender or others, the 3D object can appear much larger or smaller than intended inStoryboard Pro. Therefore, you may have to scale it up or down for it to be in the right proportions. This is because 3D modeling applications use different base units than Storyboard Pro. For example, Autodesk Maya works in centimetres, and Blender works in metres, whereas Storyboard Pro works in fields. Instead of scaling your 3D model manually in each panel where you use it, you can add a scaling factor to your 3D model as it is in your library, before you import it. From thereon, it will already be scaled according to that scaling factor whenever you import that model to one of your project's panels, and you won't have to scale it manually every time. At any time, you can change the scaling factor of your 3D model again. However, changing the scaling factor of a 3D model will cause its size to change in every panel in which it was already imported. Hence, it is important to make sure your scale factor is optimal before you start adding your 3D model to several panels. 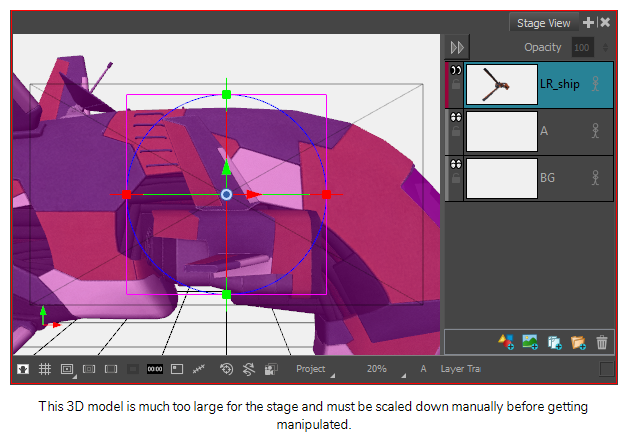 If you only need to adjust the size of your 3D model in a few panels, and not all the panels in which it appears, it might be better to adjust its size manually using the Layer Transform tool instead, as the Layer Transform tool will only affect its size in the current panel. The scale factor of a 3D model is retained if you create a template with your 3D model. Likewise, it is retained if you export your storyboard into Harmony scenes. NOTE When you apply a scaling factor to your 3D model, it affects its apparent size in your storyboard, but it does not affect the model's scale value in your panels. This means that, when you add a 3D model with a scaling factor to one of your panels, although your model already appears scaled up or down, its scale is actually still 1, which is the default value. This way, you can differentiate the scaling that was manually applied to your model using the Layer Transform tool from the scaling applied to your model because of its scaling factor.